We went to church yesterday and heard a sermon on Gideon. The speaker was fairly eloquent, very emotive, and the altar was filled at the invitation. There was even some wailing from a poor soul at the altar. With all the Amens! and laughter, and Bible verses, why was I sitting there thinking to myself, "Huh? What?" Unfortunately, too many very able preachers are not rightly dividing the Old Testament from the New Testament. Instead, they are bringing Old Testament principles into the New Testament, OR, when New Testament principles are present in the text, they're missing them. Note that phrase, "Thou mighty man of valour." The preacher said that the angel of the LORD was telling Gideon "what he would be." He said that God sees us hiding in the vineyard (inside a building) threshing our wheat (which should be done outside in the wind). He sees us in our frailty and weakness, but he knows what we could be...what we should be. "Christian, when you accepted Christ Jesus as your Saviour, you got ALL of heaven with him! All of God's grace, all of God's treasures, all of God's power! He that has the Son has Life, and he has everything else necessary for life and godliness! You are a child of God, not just a mere man. You are grafted into the Vine of God's own nature! You have overcome! You have died to sin, self, and the world, and you have been raised to live above the trials of this life! But the battle is for your mind. Satan is a liar, and he comes to convince you otherwise! So, don't just put on the helmet of salvation...realize that you can't ever take it off! Don't just put on righteousness, realize that if Christ dwells in you, you are the very righteousness of God! It's a gift. Live it by faith. Gideon, you ARE a mighty man of valor because GOD SAID SO! You are that NOW. HERE. In the PRESENT! It is not a work to be accomplished or a dream to be achieved. It is an IDENTITY to be believed." Identity, Christian, is WHO YOU ARE. HERE AND NOW. You are light. You are joined with God. You are one with the Eternal. You are delivered, holy, and you are sitting far above the battlefield, far above the enemy, and far above the strife. You are sanctified, redeemed, spotless, and glorified. It's a faith thing. If you believe it, you are. If you don't believe it, you aren't. Either way, you're right. 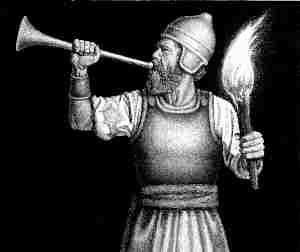 I am tired of New Testament preachers shouting, "Charge!.... Climb that hill! ... Take that mountain!" Christ Jesus did that stuff already. Now, we enter into rest. Are you resting in Christ's finished work? Are you resting in your new identity? Are you a mighty man of valor? Or, do you just hope you will be some day?